Guilford Plastic Surgery | Forever Young BBL Photofacial | Beth Collins, M.D. Looking for a non-invasive treatment that can improve the appearance of redness, skin discoloration, and sun damage with no downtime? You may want to consider the Forever Young BBL™ Photofacial. Located in Guilford CT, Beth Collins MD is dedicated to providing aesthetic treatments that can help improve the daily quality of life of our patients. For more information about our practice, or to schedule a consultation appointment online or call (203) 689-5295. 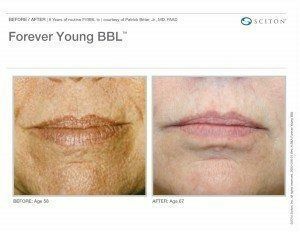 What is the Forever Young BBL™ Photofacial? The Forever Young BBL™ Photofacial is a cosmetic treatment used to combat the signs of aging, particularly those associated with vascular redness or sun damage. It harnesses the power of broad band light technology, or BBL, to target the underlying structures that cause this discoloration and destroy them. The Forever Young BBL™ Photofacial uses the power of gentle, targeted light to destroy structures that cause the signs of aging in the skin. What makes a Forever Young BBL™ Photofacial different from other laser rejuvenation treatments is the broad spectrum of light used. While laser treatments typically only use a single wavelength of light, Forever Young BBL™ Photofacials utilize several different wavelengths. These different wavelengths of light are absorbed by the blood vessels and excess pigmentation that cause vascular redness and discoloration, destroying them and the cosmetic problems they cause. What Can a Forever Young BBL™ Photofacial Treat? Each Forever Young BBL™ Photofacial treatment can last anywhere from 15-60 minutes, depending upon the size of the treatment area. Patients report that the procedure is relatively comfortable, feeling like a warm rubber band snapping against the skin. Following treatment, redness similar to that of a mild sunburn is common, and usually last about 24-hours after treatment. Mild blistering and bruising sometimes occurs but is less common. Typically, Dr. Collins recommends that patients undergo somewhere between 3-5 treatments to see significant results. These treatments must be spaced three weeks apart. 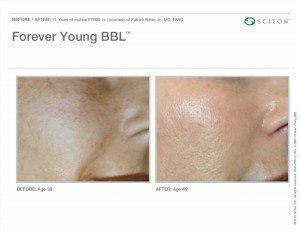 Who is not a Good Candidate for Forever Young BBL™ Photofacials? Individuals with sun-tanned skin, connective tissue diseases, autoimmune disorders or pacemakers cannot receive Forever Young BBL™ Photofacial treatments. Women who are pregnant or breastfeeding are also advised not to undergo the procedure. If you’re interested in the Forever Young BBL™ Photofacial but are not sure if you’re a candidate for the treatment, request a consultation today. We can get you started by setting up a consultation appointment, during which Dr. Collins will take into account your cosmetic goals and medical history to help decide if a Forever Young BBL™ Photofacial is right for you.